Former Irish captain Robbie Keane. 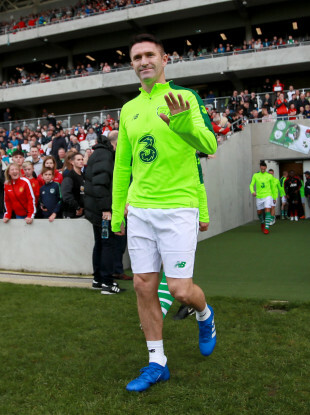 ROBBIE KEANE WILL skipper an Irish selection for a fundraiser against Liverpool Legends in aid of the Sean Cox Rehabilitation Trust on Friday, 12 April in the Aviva Stadium. The squad, to be managed by Mick McCarthy, will feature players with over 1,109 caps between them, including Keane, Damien Duff, Niall Quinn, Ray Houghton and Ronnie Whelan. The Liverpool side includes Anfield greats Robbie Fowler, Steve McManaman and Ian Rush. The proceeds from the game will go towards the rehabilitation of Cox, who was the victim of an unprovoked attack outside Anfield last year ahead of Liverpool’s Champions League tie against AS Roma and is continuing his recovery. Ticket prices start at €20 for adults, Under-16s will be €10 and a family ticket (two adults and two children) will be priced at €70. They can be purchased on Ticketmaster. Wayne Henderson, Stephen Kelly, Kevin Foley, Sean St Ledger, Kenny Cunningham, Ian Harte, Kevin Kilbane, Steven Reid, Ray Houghton, Ronnie Whelan, Colin Healy, Lee Carsley, Graham Kavanagh, Keith Fahey, Stephen McPhail, Keith Andrews, Andy Reid, Liam Lawrence, Stephen Hunt, Damien Duff, Stephen Elliott, Niall Quinn, Kevin Doyle, Robbie Keane. Email “Keane to captain Ireland XI for Sean Cox fundraiser against Liverpool Legends”. Feedback on “Keane to captain Ireland XI for Sean Cox fundraiser against Liverpool Legends”.